It's not every day you get to see a Hollywood legend in Glasgow, chatting about life, literature and the unsettling disconnect between myth and reality. So the evening ended well. But it began badly, when a helpful young lad at the Citizens ticket desk studied me sympathetically and beckoned me over to a quiet corner, where Susan couldn't overhear. "I'm sorry sir, your tickets were for the matinée," he says. "You've missed it." "See for yourself," he says, pointing to '2.30 pm' on the print-out. "It's now 7.30 pm." "Is there a problem?" Susan says, starting to walk towards us, looking smart, successful and all set for a civilised night at the theatre. "Do you have seats anywhere for this performance?" I whisper to the lad. "We're packed out tonight," he says. "Sam Shepard, who wrote the play, is in the audience and will be answering questions after the performance. There are seats in the upper circle though, which you're welcome to, since it was a genuine mistake." "That's kind of you," I say, taking the tickets and steering Susan to the small opening at the back of the vestibule. "I didn't know the Citz had an upper circle," she says. "What an adventure!" Ten minutes later we're still climbing and she's struggling to see the funny side. A flurry of snowflakes stings my face as we come across a young woman in a fleecy parka, hunched down outside a tent, boiling water on a primus stove. "Cup of tea?" she says and I'm about to say "Yes please" and take a break, when I notice Susan is showing no sign of stopping. "We'll push on to the top, thanks," she says. "Is it much further?" "Half an hour at most," the woman tells us, and we resume tramping steadily upward. Breathe, step, breathe, step. It's a hypnotic rhythm that numbs the brain, so when the storm clears suddenly to reveal three rows of seats with faded plush pile, it takes me a moment to respond to the friendly young usher who says we can sit anywhere. "Follow me," Susan says, taking me firmly by the hand. "Bloody hell, it's a long way down," I say, when we're seated and comfortable. "Can you see the stage?" "I think that's it," she says, pointing. "It looks about the size of a postage stamp." "No, that is a postage stamp," I say, reaching to pick it off the balustrade. "The stage is much further away." "Got it now," she says. "I can just make out small furry animals moving around on it." "That's the hair on the actors' heads," I say, taking a pull on the oxygen mask provided for patrons and settling down to enjoy the performance. 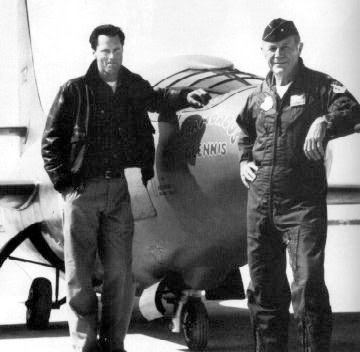 True West is a tense tale of mismatched brothers, by writer and actor Sam Shepard, whom I'll always remember as Chuck Yeager in The Right Stuff, a fantastic film about the first American astronauts. Yeager was one of the greatest pilots ever, but the astronaut programme rejected him because he didn't have a degree. "I am so looking forward to seeing Shepard after the show," I tell Susan. "His Chuck Yeager was out of this world. Shepard played him as laconic and insanely brave, as he pushed the envelope and rode his supersonic steed to the sky." "Let's hope he brought his supersonic steed with him tonight then," Susan says. "Because all we'll be seeing from up here, if he didn't, is the laconic and insanely brave bald patch on the back of his head."